The 40th Anniversary 2018 Wychavon Parish Games Presentation Evening took place at Bretforton Sports Club on Thursday 22nd November. Trophies were presented by Councillor Tony Rowley, Chairman of Wychavon District Council, representatives from Severn Trent and Sponsors of the Individual events. Wychavon Parish Games Overall champions, Bretforton. Wychavon Parish Games runners up, Badsey and Aldington. Award of Merit Trophy, shared between Harvington and Eckington. 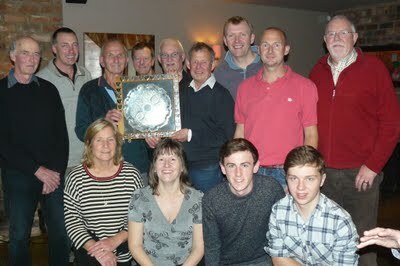 Bell Boating Runners up, Wyre Piddle. Cross Country, Runners up, Fladbury. Ladies Darts Runners Up, Fladbury. Men's Darts Runners up, Hill and Moor. Dominoes Winners, Badsey and Aldington. Five a Side Runners up, Inkberrow. Rounders Runners up, Ashton Under Hill. Skittles Runners up, Evesham Bengeworth. Junior Table Tennis Winners, Harvington. Junior Table Tennis Runners up, South Littleton. Senior Table Tennis Winners, North and Middle Littleton. Senior Table Tennis Runners up, Badsey and Aldington.